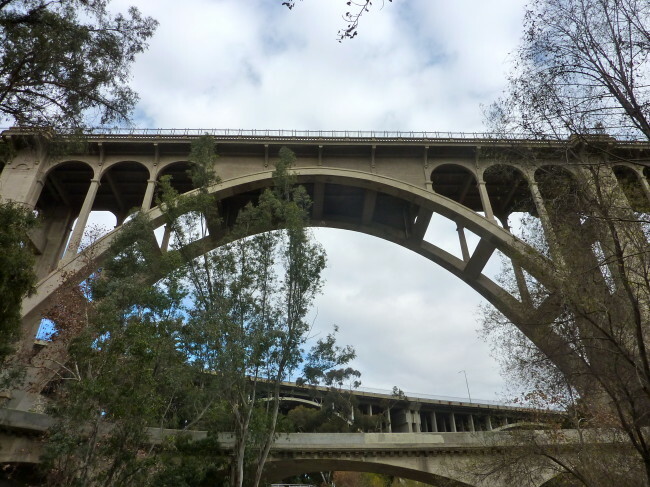 Sunday mornings mean “Adventure Time” for our two Corgis, and one spot we all like to go is the nearby Lower Arroyo Seco Trail, where there are numerous good vantage points to get a glimpse of Pasadena history, the Colorado Street Bridge (aka Suicide Bridge). 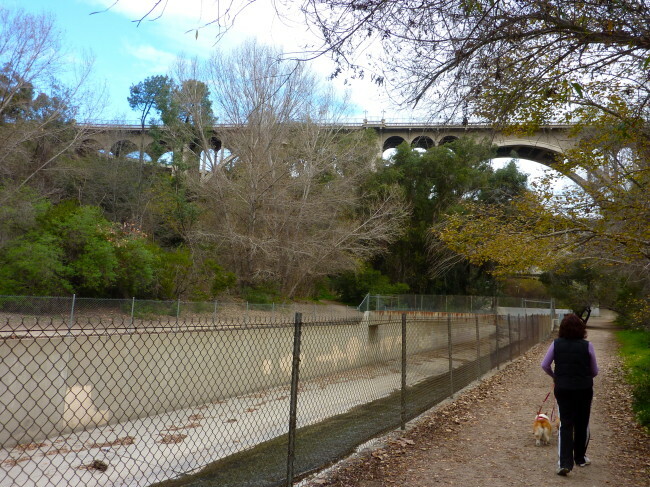 Arroyo Seco literally means dry creek, and the Lower Arroyo Seco Trail stretches from the area immediately south of the Colorado Street Bridge to the border of South Pasadena, and encompasses about 150 acres. On any given Sunday there are plenty of joggers and people out walking their dogs. 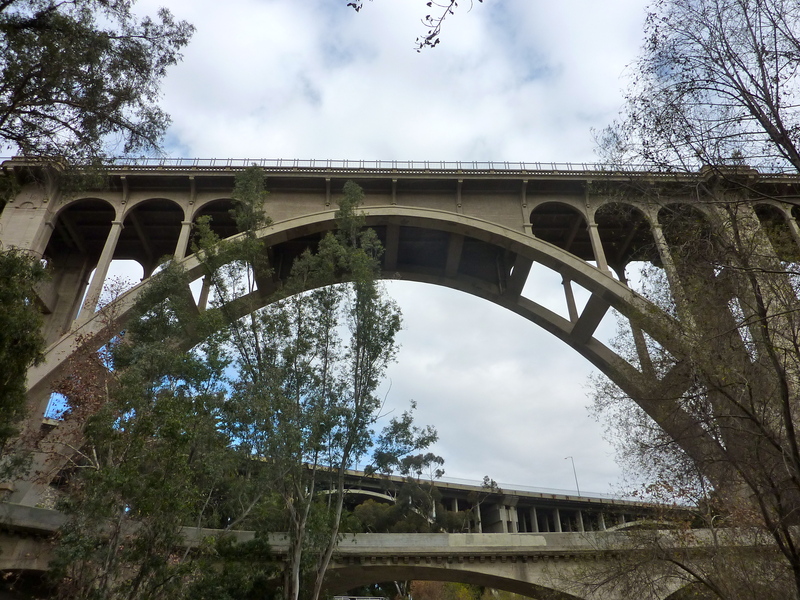 It’s here where you can catch all those views of Pasadena’s most famous bridge. The Colorado Street Bridge was designed and built in 1913 by a Kansas City, Missouri, firm. 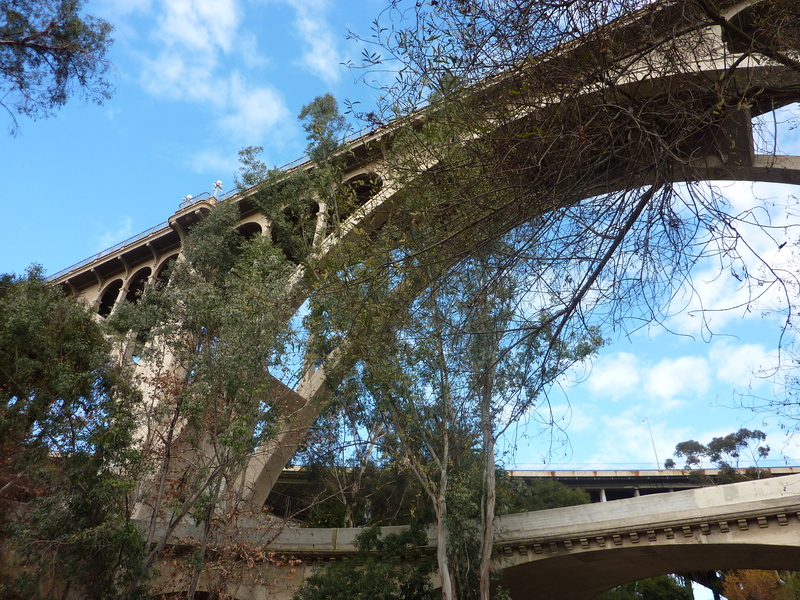 At the time of its completion, the Colorado Street Bridge was not only the first curvilinear bridge ever designed but also the tallest concrete bridge of its day. 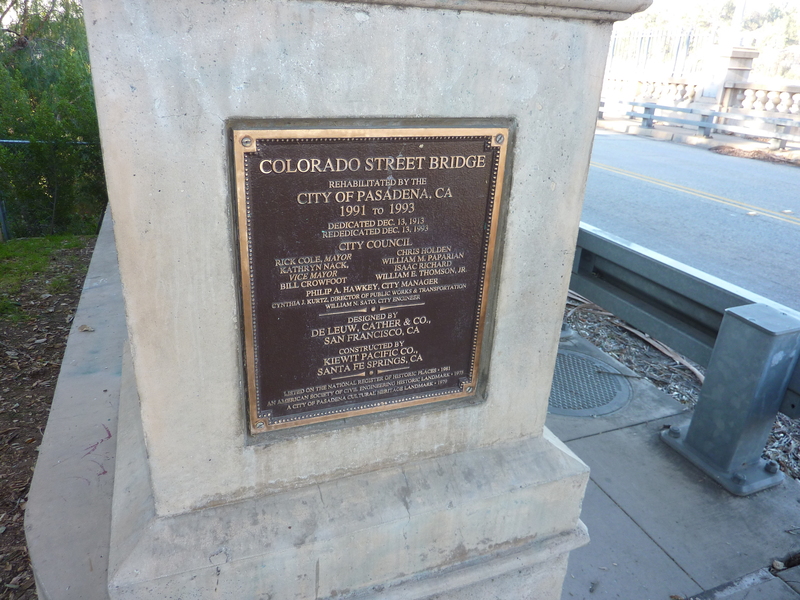 More than 3,000 Pasadenans were present for the dedication. The photo below is circa 1920. 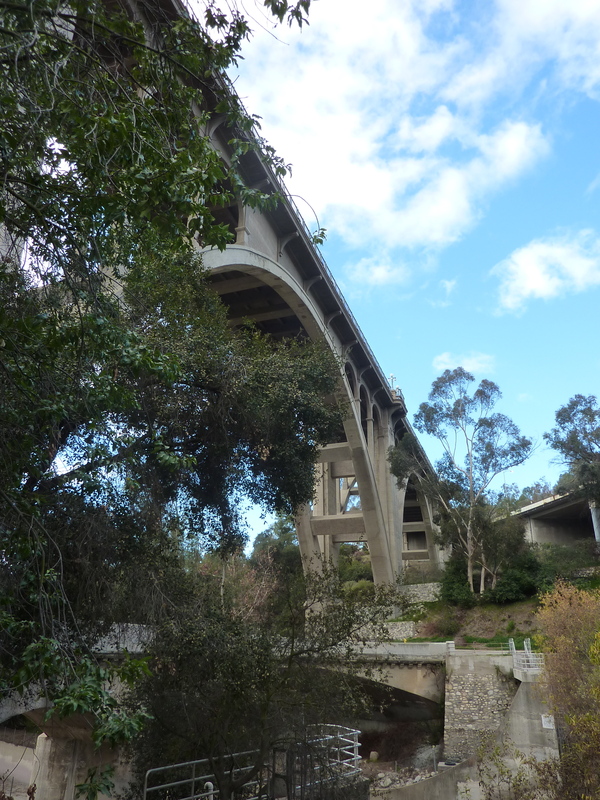 The bridge is on the National Register of Historic Places and has been designated a National Historic Civil Engineering Landmark by the American Society of Civil Engineers. It is renowned for its Beaux Arts arches, ornate lamp posts and railings. The initial design proved difficult because there was not solid footing in the Arroyo bed. 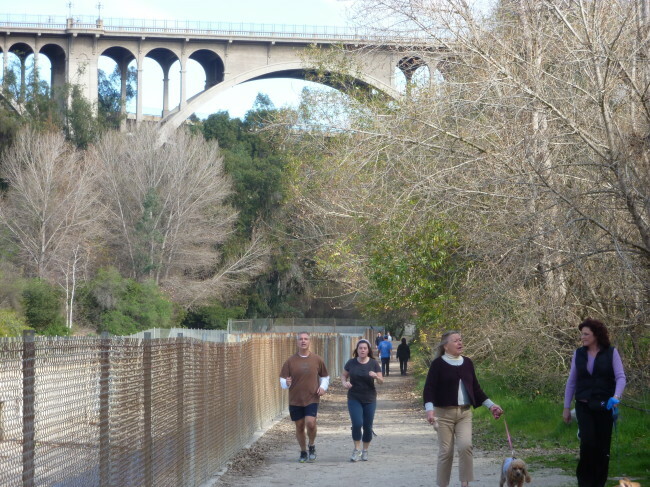 The bridges engineer, John Drake Mercereau, then conceived the idea of curving the bridge. The result was a beautiful bridge considered a work of art by many. Before the bridge was built, getting through the Arroyo Seco was quite difficult. 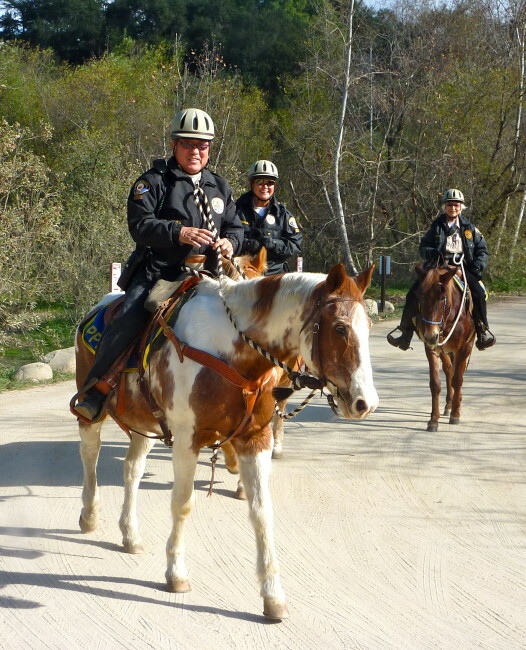 Horses and wagons had to go down the steep eastern slope, cross the stream over a smaller bridge and then had to go up a steep western bank. The building of the bridge obviously made it easier to make that journey, but not too many years after its construction, the bridge earned an ominous nickname. 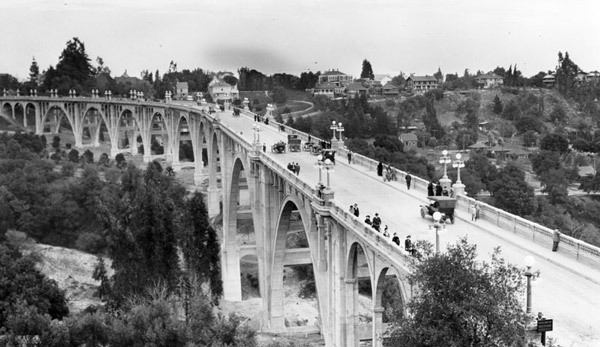 Not too long after its construction, locals began to call the Colorado Street Bridge by another name; Suicide Bridge. 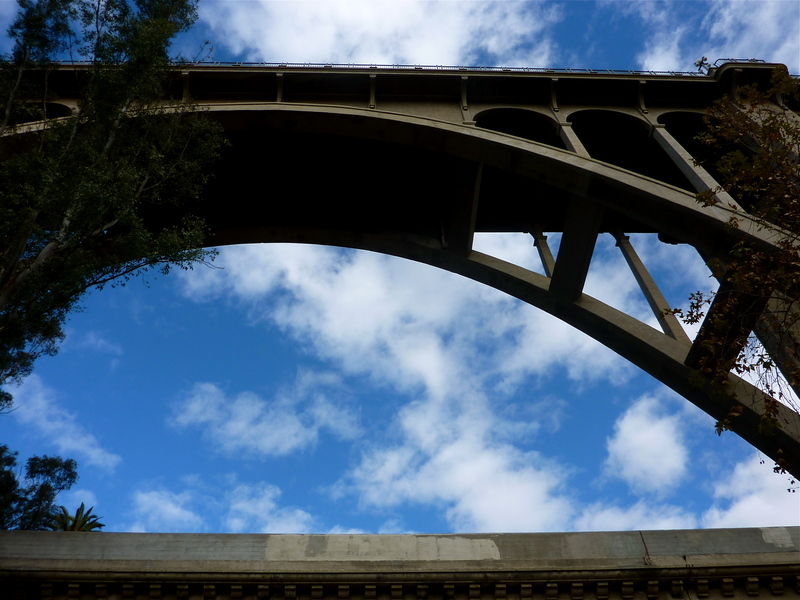 The first person to leap to their death from Suicide Bridge was in 1919, and since then more than 100 people have decided this was the place to say “adios” to their life. A suicide barrier was added which reduced the number of suicides, but the bridge retained its nickname. In 1989, after the San Francisco earthquake, the bridge was declared a seismic hazard and closed to traffic. It was reopened on December 13, 1993 (exactly 80 years after its initial opening), after undergoing a substantial retrofit. 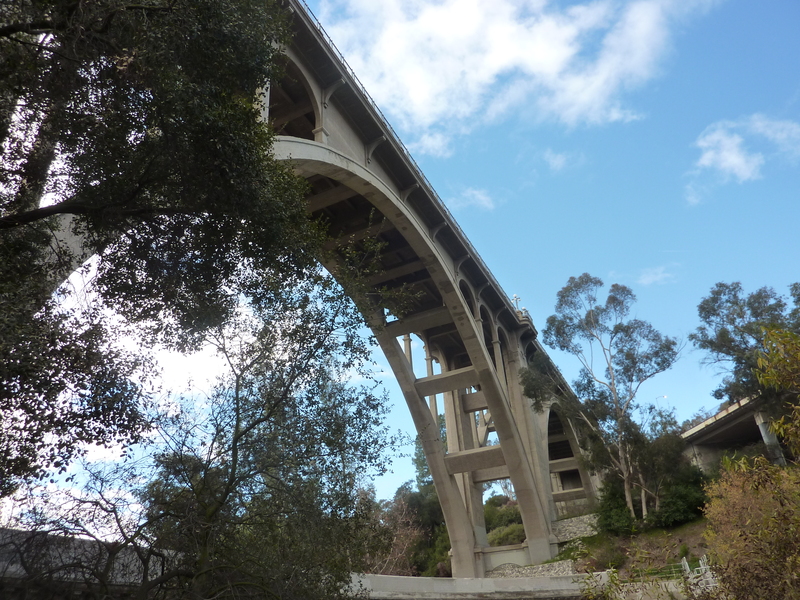 An easy way to get to the Lower Arroyo Seco Trail and some cool views of the Colorado Street Bridge is to take the 134 freeway to Orange Grove Blvd. south to California Blvd. Turn right (west) on California to Arroyo Blvd, and turn right. 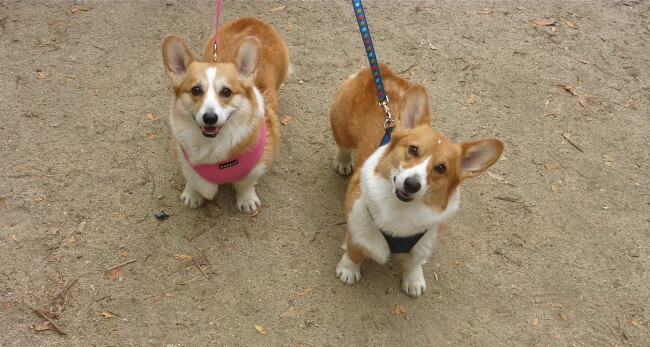 The park entrance will be on your left. Drive down the road to the parking lot, which will be on your left. You might even run into some volunteer police officers on horses and mules. 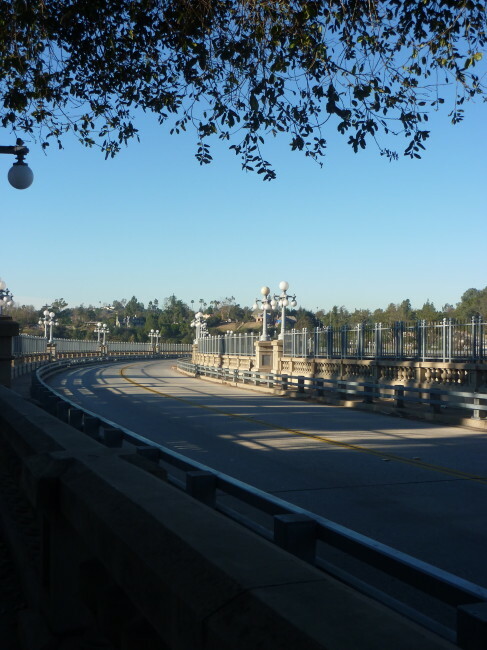 And if you decide to venture up to the bridge, try to refrain from jumping.